Moscow Ballet Great Russian Nutcracker Audition! The audition for the Great Russian Nutcracker by Moscow Ballet is coming up on Tuesday September 4, 2018 -- 5:00 pm registration, audition begins promptly at 5:30 pm LATE ARRIVALS NOT ALLOWED!!! In case you are wondering, this is a legitimate international ensemble production with professionals from Russia, Ukraine, Belarus, Moldova, Lithuania and then of course the support cast and dancers from the USA via the audition which is handled by an official Moscow Ballet audition director. This is truly a unique and magical event to take part in and to witness! We are on the Winter Holidays Break from Friday December 22, 2017 through Wednesday January 3, 2018. Classes resume on Thursday January 4, 2018. If your student wishes to enroll and take ballet please be aware there's a costume order deadline coming up FAST on Saturday January 13, 2018! In order to participate in the June 2018 performances of Swan Lake, your enrollment must be completed by Wednesday January 10 so as to allow time to also take your student's measurements. Costumes cannot be ordered at all without measurements for size being taken. Coming up Saturday December 2 at 2:00 pm and 4:00 pm - get your reservations now! As we approach the performance week for La Fille mal gardee at the Excelsior Springs PAC June 9 and 10, 7:30 pm, (The Excelsior Springs PAC is at 612 Tiger Drive, Excelsior Springs Missouri) it is time to mention what else is coming up at Ballet North! We have a very full summer of Ballet Intensives, Dance Camps, and of course our classical ballet classes. Further details below! Summer Ballet Pre-Intensive ages "about" 9 (with previous training) to 12: Monday thru Friday June 19 to 23, 9:30 am - 3:00 pm. This shorter duration Intensive still presents the all-day long at the ballet challenge of the full length intensive for those who are at the beginning level of ballet technique, and want to dial up their learning and progress during the summer which is always much easier to do since school is not in session and everyone has much more energy! Each day Pre-Intensive students will take a full length technique class, plus modern, conditioning, choreography study, work on pantomime skills and much more. NO lunch or snack is provided, please bring your own brown bag lunch daily. For the young ladies, pointe shoes are NOT required in the Pre-Intensive. Summer Ballet Intensive ages 13+ runs Monday June 19 thru Friday June 23 AND Monday June 26 thru Friday June 30; 9:30 am - 3:00 pm. This is a two-week intensive program for the intermediate dancer that wants to use the summer to augment and enhance their technical abilities. Each day a full length technique class plus pointe, basic variations, modern, tap/character and choreography learning are presented. Girls MUST be on pointe for this Intensive. NO lunch or snack served, please bring your own lunch daily. Dance Camp 1 lets the youngest dancers fill in many of the gaps about the wonderful world of the ballet that there just is never time for in a regular ballet class. Learning about the 500 year history of the ballet, art projects that teach about the major ballets such as Sleeping Beauty, Nutcracker or Don Quixote; and even learning about how the bones and muscles work and even some of what good nutrition concepts are for young athletes and of course they take a daily ballet class too! Dance Camp 1 runs Monday thru Friday July 10 - 14, 9:30 am - 11:00 am. SNACKS ARE SERVED PLEASE ADVISE OF ANY ALLERGIES!!! Dance Camp 2 for ages 6-9 continues solving the problem that there's never enough time in a ballet class to cover everything about the marvelous art form of the ballet. Dance Camp 2 lets the young student continue the learning about the world of ballet with further learning about the major figures in Ballet such as the great choreographers and their works such as Giselle or Swan Lake, with art projects that reinforce ballet concepts plus learning about pantomime story telling, muscles and bones, nutrition, and of course daily ballet class. Dance Camp 2 runs Monday thru Friday July 17 - 21, 9:30 am - 12:00 pm. SNACKS ARE SERVED PLEASE ADVISE OF ANY ALLERGIES!!! Starting Wednesday July 5 we will be on the new schedule for the next 12 months until June of 2018 - because classical ballet is learned in much the same way as music wherein long periods without practicing cause a lot of learning loss, we do NOT take the whole summer off. Please join us for an exciting year of classical ballet learning starting immediately after the 4th of July! You can find all the latest details and updates in the Home, Intensives Camps, and Ballet Classes sections of this website. Enjoy the ballet! Ballet North is very pleased to present La Fille mal gardee "The Wayward Daughter" June 9 and 10, 2017 at the Excelsior Springs Performing Arts Center, 612 Tiger Drive Excelsior Springs Missouri, 7:30 pm Friday and Saturday. A delightful mix of comedic missteps, a little romance and even dancing chickens create a captivating and truly amusing rendering of pastoral life that seems oddly accurate even in today's world. You've never seen a ballet like this before! Tickets are available online using the link on the front page of this website. See you at the stage! Getting your first pair of pointe shoes - priceless! We are rapidly filling up the Nutcracker School Tour for 2015! We have one slot available on Friday November 20, and one slot open on Friday December 11. Friday December 4 is booked full. 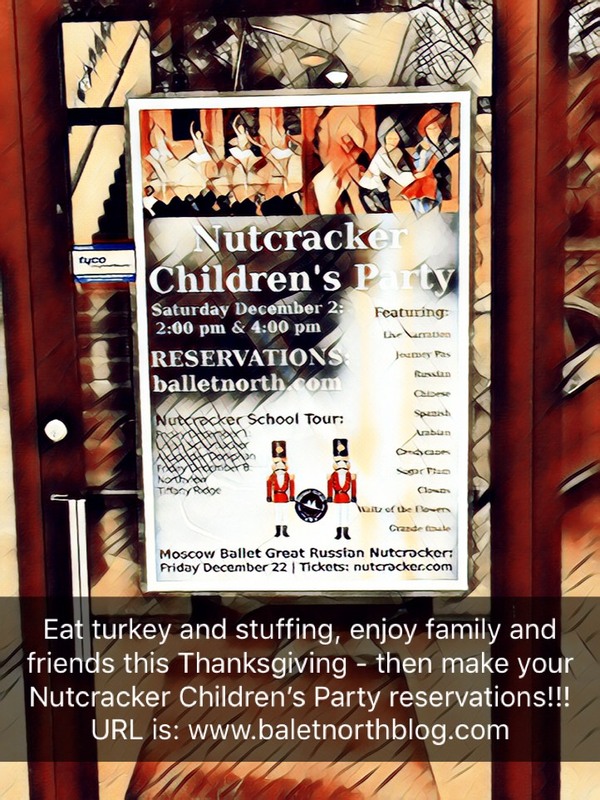 Nutcracker Children's Party reservations available at www.balletnorthblog.com starting November 1. We are very excited to journey into Wonderland this June when Ballet North presents Alice as the headline ballet in Spring Festival of Dance 2016. Also featured will be Les Sylphides and Carmen. Performances will be on two days, Friday evening and Saturday afternoon at the Liberty North Performing Arts Center. Reserve seating - tickets available starting April of 2016. On Wednesdays 6:30 - 7:00 pm. For ages 7 and up -- how it works is boys will take either Pre-Ballet 4 from 5 - 6 pm if under 10 years of age, then also take the Boy's Class from 6:30 - 7:00 pm making for an awesome double play of ballet! Boys over 10 years of age will take Grade 1 from 5 - 6:30 pm then the Boy's Class from 6:30 - 7:00 pm and pas de deux from 7 - 7:30 pm which is a tremendous tripple play of ballet skills buliding. For getting a young man started in ballet, this is as good as it gets! Summer Ballet Intensive Starts Monday June 22! For a high intensity summer ballet experience suitable for intermediate to advanced students, look no further!